So much POOP. What about Fleas? Diatomaceous earth. Part One. Poop is disgusting. No one wants to mess with poop. But poop can be a great indicator of our and our animals health. So checking poop is a necessary part of animal husbandry. Ick. Initially I was going to post photos of the poop we daily encounter. But, the stark reality of poop pictures might prove to be too much for sensitive types. I’ve been scolded for posting photo’s of what some consider gruesome subjects : like Lance’s finger when he sliced the tip off, and Lance’s finger when he shot a nail into the end, and my nose when I broke it, and my nose after surgery to set it, so I get that not everyone thinks the raw things of life are interesting. So no glossies of poop. But, if there were photos, they would include: pig poop, goat poop, sheep poop, turkey poop, chicken poop, dog and cat poop. There’s a book called, “Everybody Poops”. This book is not a work of fiction. Poop is a problem because it’s the carrier of things that do not belong inside our bodies. And, sometimes parasites and worms will invade to live in the warmth and ick that is poop. There are good worms. Helpful worms. In the spring I added Red Wigglers to my raised garden beds to help irrigate and nourish my soil. Night crawlers lure fish onto hooks so we can eat them. But mostly there are are gross worms. These are the, ‘why did you create these things, God?’, parasites that live in the guts of living beings. There are heartworm, pole worms, tapeworms, whipworms, and pinworms to name a few, When the animals poop worm pieces or the whole worm, will be in the feces. Then they are on the soil. When the animals graze that area, they ingest more parasites/worms. Parasites are not the only problem with poop. Poop attracts flies which then breed. This gives us creepy maggots and then more flies. Flies are nothing more than poop transporters. They alight on poop and then alight on garbage and then alight on poop and then alight on your wall, at which time you smack it and splat all the fly’s souvenirs. Let’s just say it: poop is nasty. Although, if we didn’t poop, well that would be much nastier. When we developed our homestead or hobby farm plan, we knew right off we would engage in natural and organic practices. One of the reasons we raise chickens is to have eggs that have not been pushed through a hormone antibiotic laden hen. We use no pesticides on our vegetables or fruit trees. So, using chemicals to kill ground pests, no matter how foul they are, would be counter to what we believe. This is where Diatomaceous Earth or DE comes in super handy. Use caution when using DE. Use only FOOD grade DE and NOT POOL grade. DE is similar in consistency to a dusting powder. DE can irritate eyes, noses and lungs. We make sure the animals are not around when we spread it, because any wind or breeze can easily carry it to them. we don’t want to subject them to any discomfort if possible. Chickens have fragile respiratory systems, so if you choose to use it in their coop as I do because it helps keep lice, flea, mosquito fly and mite populations down, use it after you’ve cleaned out the coop, and spread new bedding. Do not use it when the chickens are IN the coop. DE is also useful for parasites and pests on livestock. When we trim hooves, we liberally apply DE to the sheep and goats hides. Behind the ears, around the rear, and down the backs. It helps get rid of what might be there, and repel intruders. We like to use the DE product from Red earth. 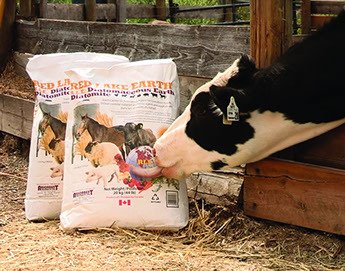 http://www.redlakeearth.com/red-lake-diatomaceous-earth-us.html We mix our own feed and use DE as a top dressing for natural deworming. Some folks also leave it as a free choice for their animals. I did read where a woman lost her chickens after spreading DE in their coop, but she spread it when they were in there, and she didn’t indicate whether it was FOOD grade or POOL grade. So be careful when you use it. DE can also be used for flea control. We brought three flea infested barn kittens home. Kittens are so delicate and small you can’t really use any typical chemical laden flea control products on them. Initially we bathed them in Dawn dish soap and used flea combs. We spread DE in their litter box, and their bedding and around the pool house where their food and beds are. We add DE to our cats food, too. This site has dosage recommendations and more information about worming our domestic pets with DE. I’ve always believed that God put on earth everything we need to live and be healthy. I don’t understand some of the things he created, like fleas and muzzles and flies, but He knows what’s He’s doing. I started researching natural remedies back in the 80s We’ve planted herbs that we can use for cooking, but also we put fresh cut and dried herbs in the coop, where they turkeys are and in the livestock area. This includes mint, thyme, sage, peppermint, and lavender. Smells good and helps repel pests. If you can do a natural God given remedy, why not?? Using this life viewpoint, I’ve extensively researched the use of natural remedies, herbs, essential oils etch, and the news is good and fascinating. I didn’t mean for this post to turn into a huge endorsement for DE, but it did. The second part will address the use of Essential Oils at Baldwin Acres. Thanks for reading. Have a beautiful day.